Some things never cease to amaze and this is certainly one of these cases where you first read things twice before believing it: Emotional Support Turkey On Board !! Mr. Gobble is called ‘Easter’ and turned out to be the best pal of the passenger who lovingly carries him around during her travels to help her overcome grievances. Mind you that this incident which went viral some time ago took place in the U.S. (where else, really) on a Delta Airlines flight from Seattle to Salt Lake City. I have seen pictures and hear say stories popping up here and there but this week The Mirror in the UK (access here) brought the first ‘full on’ story on Easter’s travel tales. A woman who took a live turkey on a Delta Air Lines flight was bringing the ’emotional support’ animal to her family’s home for Christmas. Jodie Smalley, from Seattle, Washington state, was spotted using her yellow-beaked bird, Easter, as a ‘therapy’ pet during her two-hour flight to Salt Lake City in Utah. After the plane touched down, she lovingly pushed the feathered creature through the airport in a wheelchair, before taking it to her brother’s house for festive celebrations. This is because, Ms Smalley says, Easter offers her comfort – and reminds her on a daily basis that ‘there is a reason to smile and to care, no matter how bad things are’. Uh huh… ok I guess whatever floats your boat. If you follow the article and the pictures attached you see that both ‘passengers’ (Easter seemingly was a lap-passenger) had a regular seat and the row was full. Two more passengers right next to them who reportedly found it funny. Included was also this candid shot of Mr. Gobble enjoying the view from his window seat. 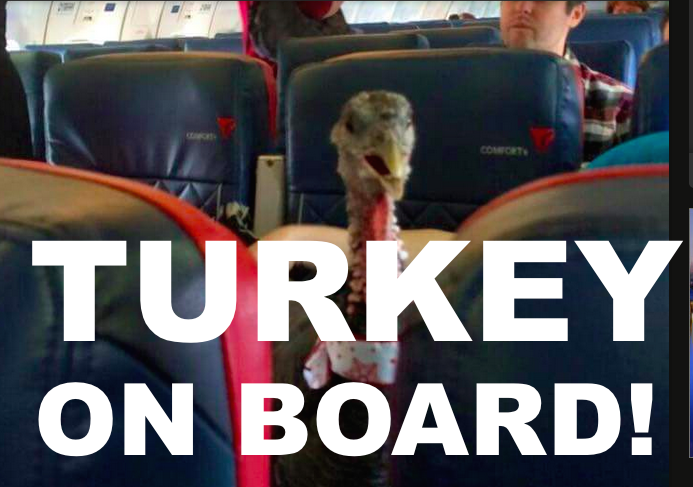 The turkey was allowed to travel on the flight under the Air Carrier Access Act 1968, which legally permits customers to fly with emotional support animals. Ms Smalley, who lost her husband in recent years, wrote on Facebook how she adopted the animal after her friends spotted the then-chick shivering in the road on Easter Day. She quickly fell in love with the creature and found it comforting at a hard time in her life. “Easter came to me as a tiny poult at an emotionally difficult time in my life,” Ms Smalley said. Stunned passengers and cabin crew members snapped photos of the turkey sitting happily on a plane seat and being carted through the airport in the wheelchair. Some of these pictures were later posted them online, where they quickly went viral. Ms Smalley said her pet’s new-found fame had resulted in inaccurate ‘assumptions’ being made about herself and her pet. No offense but I guess that comes with the territory if you shuttle your Turkey around in a passenger plane. Do you expect people to just nod and carry on with their business after such a sight? What does Delta Airlines say about all this? Although Delta allows ‘domestic’ birds on flights, its rules state that ‘farm poultry’ are ‘unacceptable’ travel companions, meaning Easter was lucky to make the flight. A Delta spokesman told USA Today in a statement: “Delta complies with the Air Carrier Access Act by allowing customers traveling with emotional support animals or psychiatric service animals to travel without charge in the cabin. “While we can’t always accommodate all pets, Delta employees made a judgment call based in part on extensive documentation from the customer. Fair enough. Being considerate is something you don’t see too often from an airline these days and it either proves a high degree of customer friendliness or a high degree of being scared of being sued due to non-compliance with the ACAA. In the very least Delta could have blocked the seat next to lady and her feathered companion because as considerate their decision is towards her, I find it extremely inconsiderate towards other passengers having to sit next to a Turkey you don’t know how he will behave during the flight (emphasis on the above mentioned bowel activity). I would think that many people (myself included) would have refused to sit next to the animal. This situation shines a light on passenger rights and I’d be interested to know how Delta would have dealt with passengers who would indeed refuse to be seated next to them. Do you have the right to a Turkey Free Zone?